CARACAS - Since 2015, three million Venezuelans have fled from the economic and political crisis in their country. That is what the United Nations (UN) says. Neighboring country Colombia received by far the most Venezuelans: one million. Peru received half a million, Ecuador 220,000 and Argentina around 130,000. 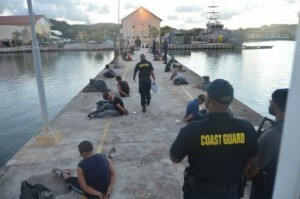 Tens of thousands sought a safe haven on Aruba and Curaçao. The number of refugees from Venezuela has increased enormously over the past six months, says William Spindler of the UN Refugee Organization. The reason is the economy that is sinking deeper and deeper and the political struggles in the country. There is also a shortage of food and medicines. The difficult situation often leads to violence between police and demonstrators. Nicolas Maduro, who has been president of Venezuela since 2013, has taken more and more power over the past few years. He acts hard against political opponents. Maduro calls the figures on the refugee flow "fake news" and "a means to justify foreign interference in Venezuelan affairs".